Hazard maps generated as part of the SCEC CyberShake project, indicate the maximum amount of shaking expected at a particular geographic location over a certain period of time. The hazard maps are used by civil engineers to determine building design tolerances. CyberShake delivers new insights into how rupture directivity and sedimentary basin effects contribute to the shaking experienced at different geographic locations. As a result more accurate hazard maps can be created. The CyberShake Workflows consists of MPI style (tightly coupled) jobs generating the Strain Green Tensors that are then postprocessed for each geographical site ( a 10x10km region). The post processing jobs are hundreds of thousands of loosely coupled jobs that generate seismograms and peak spectral acceleration values. Processed data from each site is used to generate a hazard curve and several hundred curves are used to create a hazard map. 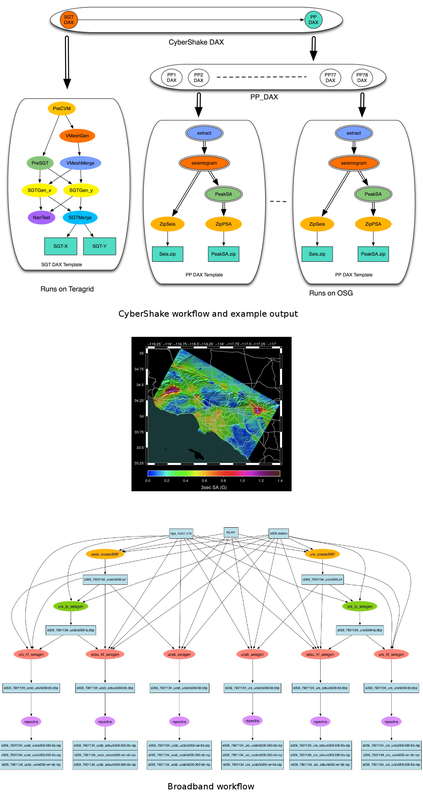 Pegasus maps the CyberShake workflows onto SCEC, NSF XSEDE and OSG (Open Science Grid) CyberInfrastructure resources. The Hazard map on the right is the result of running CyberShake on SCEC and TeraGrid in the Spring of 2009. The workflows ran over a period of 56 days and produced about 276 TB of data (11TB final output + 265TB intermediate) using 607 CPU Years. Broadband platform enables researchers to combine long period (<1.0Hz) deterministic seismograms with high frequency (~10Hz) stochastic seismograms. These broadband seismograms contain the frequencies of interest to engineering community. Traditionally, earthquake engineers have used scalar ground motion intensity measures (i.e., spectral acceleration – SA, peak ground acceleration – PGA, peak ground velocity -PGV) obtained from ground motion prediction equations (GMPEs) for their building design procedures. In recent years, an increasing awareness has emerged of the advantages of using ground-motion time series for more realistic non-linear dynamic analysis of buildings and performance-based earthquake engineering. SCEC plans to utilize Pegasus for running simulations in the Broadband platform. The image shows a broadband workflow for a single source, station and velocity file. Plans are to run workflows that involve 10’s to 100’s of sources and 100’s of stations. As a result more accurate hazard maps can be created. In 2006, SCEC ran two CyberShake post-processing workflows on the TeraGrid. Those two workflows took 23 days to complete and included 87,000 jobs. In 2008, SCEC increased the size of the workflows to over 840,000 tasks and increased the number of workflows to 36. The runtime of each of these workflows was 18 hrs using 400 cores. Substantial improvements in performance were realized through algorithmic changes in the application and the use of task clustering and other Pegasus optimizations. In 2009 SCEC ran 223 workflows over a period of eight weeks, with a workflow being completed every 5.4 hours. Over the eight weeks, an average 4,420 cores on TG Ranger was used at any point in time, with a peak of 14,540 cores. There were 192 million application tasks executed and 192 million files produced. A total of 11 TB of output data was stored and 165 TB of temporary data was generated. 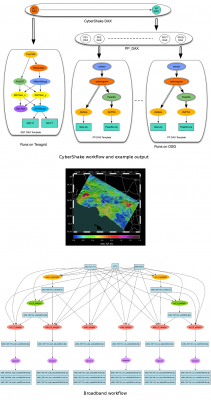 In 2010 CyberShake was also run across the National CyberInfrastructure (Open Science Grid and TeraGrid). SCEC also uses Pegasus to run the Broadband application, which generates and compares seismograms from several different earthquake simulation codes. The image below shows a broadband workflow for a single source, stations and velocity file. Plans are to run workflows that involve 10’s to 100’s of sources and 100’s of stations. SCEC is also using Pegasus and DAGMan in the Earthworks Portal, a TeraGrid Science Gateway, hosted at Washington University that allows users to configure and execute earthquake wave propagation simulations structured as workflows through a simple portal interface. David Okaya of SCEC has an interesting slide on Benefits of Scientific Workflows for an application scientists perspective.